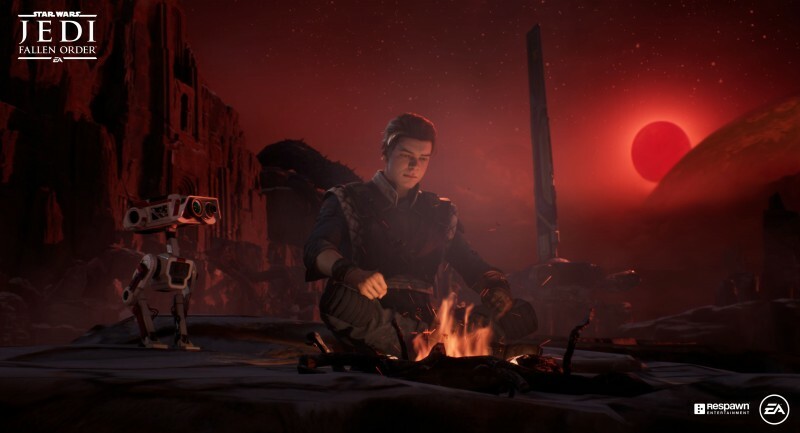 Following today's reveal of Star Wars Jedi: Fallen Order, I chatted briefly with Steve Blank, Lucasfilm's director of franchise content and strategy, and Stig Asmussen, Respawn Entertainment's director of the Fallen Order, to learn more about what players can expect from this Jedi-driven experience. The duo didn't want to go much into story specifics or gameplay at this point, but did share some new tidbits about the setting and the overall development process of the project. It's a time of desperation for the Jedi. They are either on the run or are in hiding, hoping that the Empire won't find them. Walk me through Cal's place in this universe. What concept did you land on for him as a character? Steve Blank: Cal came organically out of a story we were crafting. What you were alluding to is the dark times, after Episode III, when the Jedi have fallen and are predominantly eliminated. We thought that was a really interesting space to start a story. What do the Jedi look like in that space? What does it mean to have lived through this purge, and how do you deal with that in this new era? Cal came out of that. We have a padawan that hasn't been fully trained, but now sort of is living in this space. The layers of personality and specifics of story all of that came when Cameron [Monaghan] got added and found his voice. It was a process to settle on the specificity of that character. Stig Asmussen: Even before any of that, the team was thinking more about [the game] mechanically. There was something that really drove us to have a younger character. We didn't want it to be what you often times see in games. I'm not going to say what it is, but you know what I mean. We like the idea of him being younger because he can learn and grow. That works well mechanically because you can build up your abilities over the course of the game. Even stripping it back from something that isn't even Star Wars made us think about the framework that we need for this character just for a video game. SA: A lot of teams are like, "We really need to pitch what the game is like, and the tone, and setup." It's easier to do something like that with a movie. For Respawn, we really focus on the gameplay. Everything that we were delivering to Lucasfilm and sharing internally at Respawn and EA was all "Get your hands on the sticks and play it, and watch how it's evolving." SB: It speaks to their great partnership there, and the process of developing the game. We knew Star Wars Celebration was going to be the moment in which we were going to unveil stuff. We started having those conversations of what does it look like publicly. Bracca is a new planet in the Star Wars universe. Can you walk me through what we can expect from it? Are those big sarlacc pits beneath the ships? If so, that's a dangerous place to work. SA: We do have more characters to reveal. The trailer showed Cere. We knew we weren't going to be able to make a game that has huge crowds in it. I don't want to worry about things like creating crowd tech. We decided to make a story that's more "man versus wild." That allowed us the range to go to different places. It's not just Cal versus the environment, but also Cal versus the elements. To a certain extent, the Empire versus the elements as well. SA: It's kind of a theme that continues through the game. What has Cameron brought to the project that you maybe didn't expect when you were dreaming up Cal as a character?